It was the fifth and final night of A Year of Giving at the 2012 Fringe Festival. We sold out the day before and had several people trying to get tickets at the door – unfortunately they were turned away. The performance went very well. I was really happy to that my friend Anthony from Day 67 was in the audience! That being said, the evening was a bit sad in that the show was coming to an end. A lot of hard work, time, energy and heart went into bringing this production to the stage and I am very thankful for all of those who were a part of that. On this final evening, I gave my $10 to a woman seated near the back of the audience. I picked her because she kept looking straight ahead when I went into the audience…you know the type that is saying, “Please don’t pick me.” I actually like to choose them! Well, instead of me telling you how it happened, I am going to let Dale S. Brown, my $10 recipient that evening, tell you through her words that she so kindly sent to me via email. Here you go. So last Sunday we did a matinée show. It went really well and we had a good crowd for a Sunday afternoon. Celia Wren from the Washington Post was there and did a very nice review on A Year of Giving – check it out! Friday night was a great show! We sold all but 5 or 6 tickets. It was the first show I did without forgetting some portion of the play…thankfully the way the play was created it makes it quite easy to go on if you forget something without letting the audience know. 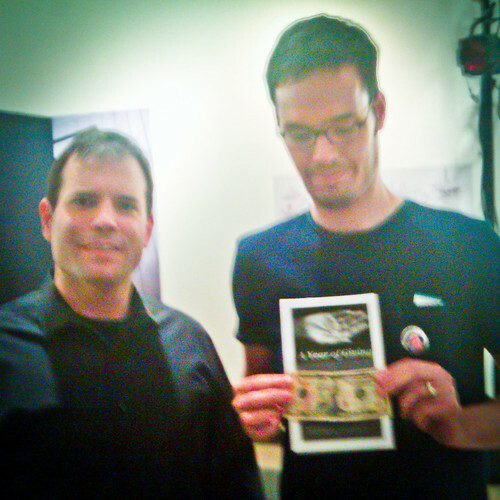 As I had done the previous two shows, I gave my daily $10 to an audience member. I handed it to a tall guy (ok, a lot of people seem tall compared to me!) seated on the left side of the audience. He told me his name was Josh. 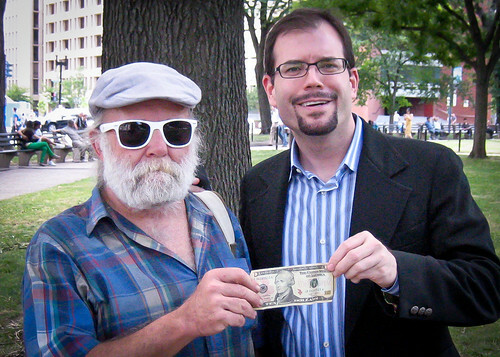 Normally after the show I find the $10 recipient and take a few minutes to grab a photo and ask a few questions – just as I did every day during my year-long journey in 2010. Unfortunately this one got away! Well, I looked at the ticket list and found someone named Josh and Googled him, found someone in DC with his name and I sent him a tweet hoping that he was in fact the same Josh who was at my show. It was, and as it turns out, he is a critic for DCist and was reviewing our show! Oh no. I hope the fact that I gave him $10 didn’t make him feel like he couldn’t do a fair review…I mean after all it is just $10 and I had no idea who he was. Yesterday, his review was published. “A Year of Giving is among the best shows I’ve ever seen at the Capital Fringe Festival,” he said. Wow…what a compliment! Today I traded some emails with Josh to find out a little bit about him and what he planned to do with my ten spot! Josh, who moved her from Brooklyn, NY, has settled in Columbia Heights. He’s a busy guy. 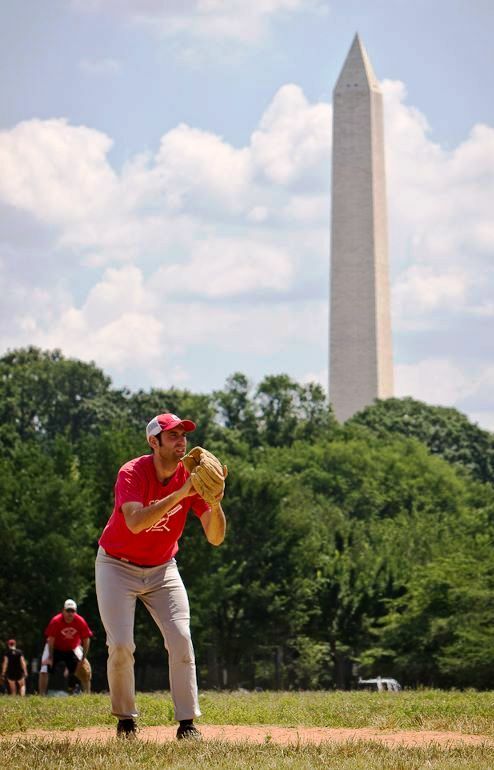 In addition to being a contributor for DCist, he works on environmental policy issues. And when he is not hard at work, you might find him playing softball or football, checking out some authentic Asian cuisine at Eden Center in Fall’s Church, or making some final arrangements for his wedding this fall. Congratulations Josh! As for the $10, Josh said he plans on giving it to, “someone on the street that seems like they need it, like someone who is homeless but is not panhandling.” Hopefully he will leave a comment here and share how it goes once he has passed it on. Also in attendance this evening were two other friends of the Year of Giving: Brad D. from Day 101 and Robert E. from Day 225. 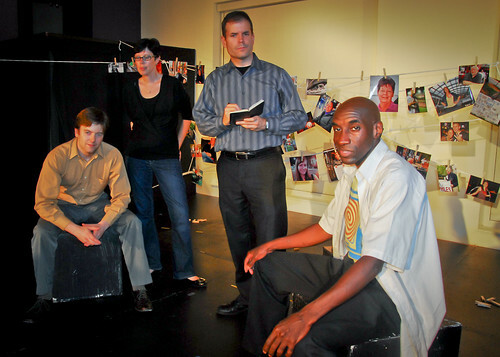 Both their stories are woven into the stage version of the project. Thanks for coming out to support the show! Oh, and as always, Knox, from Day 1, was outside shinning shoes! Only one show left and based on current ticket sales, it should sell out, so get your tickets in advance. 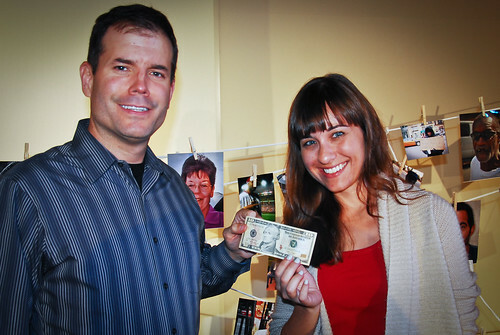 Reed handing Sabrina $10 during Tuesday night’s performance of A Year of Giving. So my unsuspecting $10 recipient on Tuesday night was Sabrina S. from Washington, DC. I picked her out of the crowd – about 5 rows deep. She was seated next to a woman who I later found out to be her mother, Patty. Trained as an attorney, she told me that she only uses her legal prowess for good. She’s worked for a variety of international agencies and been stationed in places where most of us would think twice about accepting a post; Iraq for example. “I might be headed to Kabul later this year,” she said in the same tone as you might expect someone heading off to the beach for a long weekend. “It’s like an early birthday gift she said,” referring that her birthday was the following day. “I’m not sure how I am going to use the $10, but I will promise you this, whatever I do with it it will get leveraged to do even more good.” – something she said she learned while working for USAID. We snapped a photo and said our goodbyes. Happy birthday Sabrina. Happy Worldwide Day of Giving!!! I spent the day at Nonprofit 2.0 unconference conference sharing ideas and strategies for nonprofits in a social networking world. On my way home I cut through Dupont Circle – one of my old haunts when I did my year-long commitment to giving ten dollars a day away in 2010. I made a lap around the circle looking for my recipient and spotted Dave K. rooting through a garbage can. Although he never said it, I believe the 45-year-old former science teacher from New York is homeless right now. His faded pants and worn sneakers were putting in overtime. His missing teeth didn’t stop him from being really generous with his smile that was tucked away under a thick cotton-white beard. The sunlight shifted back and forth on his face as the leaves above waved in the wind. I asked him why he was no longer working and he placed his index finger over his pursed lips. “There are some things that I prefer not to talk about,” he said. I could sense that he was satisfied with our talk and was ready to move on. I asked a guy walking by to snap our picture, invited him to small happy hour celebration for the Worldwide Day of Giving tonight at L’Enfant Cafe and Bar. He smiled again and we shook hands goodbye. He wandered over to another garbage can and leaned in to sift through the refuse. It felt great to give away the $10. I still do it from time to time but I don’t write about it…so this was kind of special as I enjoy sharing the stories of the amazing people I meet. Click here to check out other stories of people participating in the Worldwide Day of Giving. Merry Christmas everyone! It seemed rather appropriate to make a post today – on a day that many of us associate with the spirit of giving. So now that your family room looks like a tornado went through it and destroyed an entire city built of wrapping paper, take a moment to enjoy a little update some holiday kindness investing. 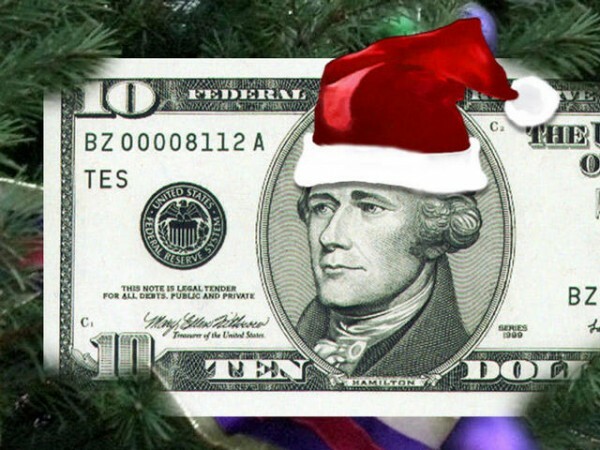 At the end of December 2010 I stopped my year-long journey of giving away $10 a day. Well, sorta. I’ve found myself on many occasions giving a ten-spot away this year, I just chose not to write up the stories every day like I did last year. But this last week I did a little extra kindness investing. I went out to meet up with a former colleague of mine, Jess, for lunch. I laugh because she say’s that I am one of two “famous” people she knows – the other is her brother who is an elementary school principal who is also a local legend singer/song-writer in Rochester, MN. Anyway, on my way over to meet her I decided to go run a few errands and I bumped into Kenneth B. from Day 30. Normally I find him pacing back and forth hawking the Street Sense paper but this day he sat deep in a folding chair barking his familiar cadence, “Street Sense! 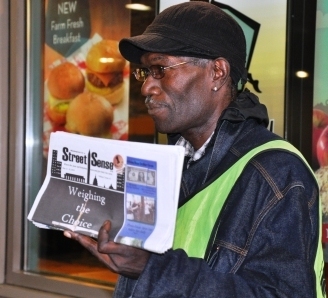 … Street Sense!” I was in a bit of a hurry and didn’t want to be late to my lunch meeting but I did want to stop and wish Kenneth a happy holiday and give him a few dollars. As I left, I placed a twenty in his hand – $10 from a Year of Giving supporter in Havertown, PA which I matched with a ten of my own. I then hopped on the Metro and headed downtown. On the train I started thinking that maybe it would be fun to do a little extra giving and I decided that I would give $10 to each person I passed that day who was asking for money. How much money would that add up to? I mean there are days that I feel like I am surrounded by panhandlers in this town. As I reached the top of the escalators at Metro Center I saw a man with a plastic cup extended toward those exiting the station. I reached into my wallet, found a ten-dollar bill and handed it to him. “Thank you very much!” he said quickly as he tucked it into his cup. After lunch I headed over to Macy’s to look for a gift I still needed to get. I was sure that I would give $10 to the Salvation Army bell-ringer – but to my surprise there was no bell-ringer in sight. But I did pass plenty of other people and before the day had ended I had passed nine more. One of those was Tommy B. – a Street Sense vendor who ended up being my $10 recipient on Day 155. He was doing well and was planning to head down to South Carolina the next day to spend Christmas with his sister. Like Kenneth, I gave him $20. This time I paid forward a $10 donation I had received from Marcio from New Zealand matched with $10 of my own. He was thankful and gave me a warm hug when I said goodbye. It was a bit nostalgic giving away ten-spots for the day. Somehow it felt right given the holiday season – but as I have said before, it’s not just the holidays that people need help. They need it even on sunny days in June. So as we approach a new year I hope you will take a moment to think about how you might be able to help others and make a plan, even if it is just in your head, about what you will do. Nobody else needs to know, but it will help you stick with it. Drop me a note if you need some help.